Does anyone else have silverware in their silverware drawer that you have NO IDEA where it came from, that doesn’t match the set(s) that you normally use? We realized today that we’d accumulated quite a bit in our silverware drawer, tucked in at the front where it was sort of a nuisance when you reached back to get to the actual organized silverware in their individual little knives/forks/spoons compartments. 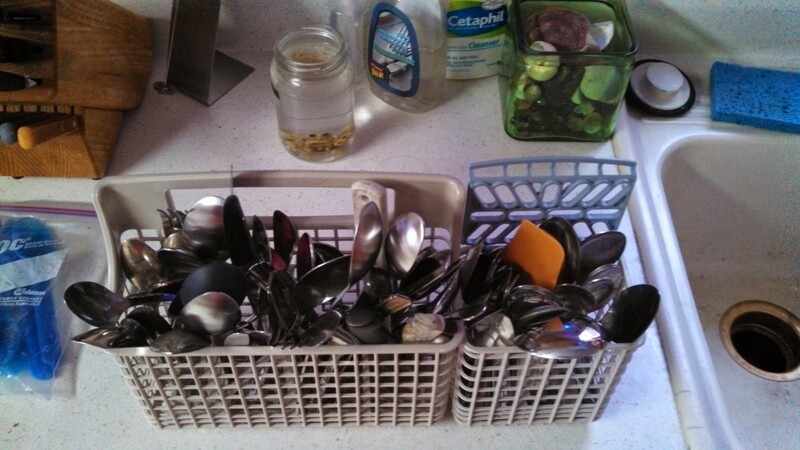 I hauled it out and Carole found the Ziploc bag in the basement where, over the last 18 years, we’ve been tossing other excess silverware whenever the amount in the drawer got to be too inconvenient. And wow, there’s a lot of it. We washed it all on a sani cycle before sorting it out, with the thought of throwing some away and donating some of the rest to whomever takes excess silverware (Goodwill, I guess), and it really was something to behold. Maybe four or five spoons that are in that mess are there because they fell into the garbage disposal and got battered around a bit before we could intervene, but the rest is just accumulation from God knows where. Eighteen years’ worth. If anyone’s missing any, it’s possible that yours fell through a wormhole and wound up in our house. If that’s so, perhaps you got our missing socks in return.